If you’ve been following the Game Maker activities, or if you had a look at the Skillset Industry Standards, you’ll probably have realised by now that developing a ‘major’ game title can be a significant task – writers, game designers, sound designers, visual artists and more must work together to create the actual game. So what sort of team – and what sort of development process – is involved in developing a game? To get you in the mood, read section 1 of the Gamasutra article A Primer for the Design Process, Part 1: Do. What questions do game designers need to ask before they start to work on the design of a game? Which key team members need appointing right at the start of the game design and development process? Now, let’s consider the case of an educational game, where as well as the game development team, we require input from educational specialists. With respect to the above diagram, which is taken from the online article Game Development Process, write down a sequence of activities you think are likely to be involved in the game development process, and identify when you think people filling each of the roles will be involved? Are any roles missing from the diagram? The concept development phase takes the germ of an idea for a game, works it up as a game outline, and tests it out on potential audiences. This phase ends with the production of a concept document, as discussed in Quick – Find Out About Some Platform Games…. The aim of the Design phase is to produce a design document that can be given to a game development team – the actual programmers, artists and sound designers – and turned into a working game. The game itself is likely to go through several stages of development as it tested. What do you think the testing phase is designed to uncover? The testing phase is a crucial part of this style of game development process. As well as uncovering potential programming bugs – such as in-game objects not working properly – it must also check for inconsistencies in narrative structure of the game, consistency (and completeness) of artwork, as well as testing the gameplay: is the game engaging, too easy, or too hard, for example. Arguably the most important phase of the game development process is the creation of the game design document. Program Ace is a game development/project management company that offers a range of services from “Full Cycle Game Development”, through “Art Assets Creation”, “Animation and Cinematic” development, “Level Design” and “Programming”. If you look at their Game Development Process (they have removed part of the process diagram for commercial reasons), you will see an outline of how they structure a game design document. 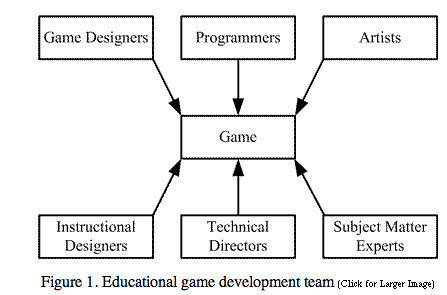 Make a note of the common features across the Program Ace design document outline and the educational game design document outlined here: Instructional Game Design Document [archived]? Write down the major differences between the two document structures. Now read section 2 of A Primer for the Design Process, Part 1: Do. Write down any similarities or differences between the structure and approach to the game design document described there compared to the other two design documents referred to above? Sketch out an outline for a game design document of your own based on the above examples that incorporates what you believe are the key elements of a game design document. Does it include or omit any items compared to the example documents? If so, why? See if you can find further examples of game design documents on the web. (The gamedev.net Design Documents resource area is a good place to start…) How does their structure compare with your outline design document (that is, what are the major similarities and differences between the documents? Reblogged this on Hey Mr. Hayes!. Augmented Reality and Autonomous Vehicles – Enabled by the Same Technologies?